A few simple ingredients becoming gorgeous mouthfuls... My favorite way to cook summer fare. 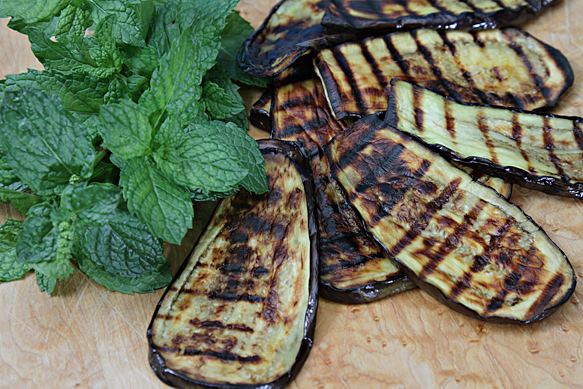 Grilling turns the rather spongy, bland eggplant into something utterly succulent. 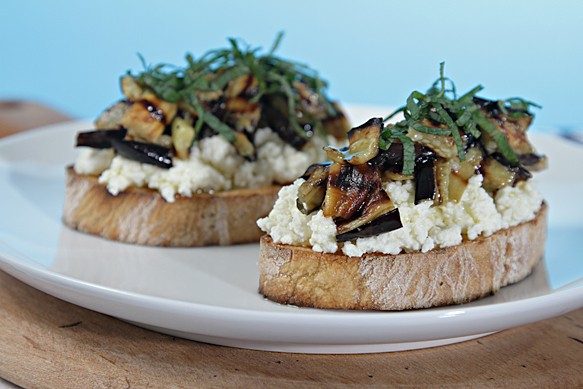 Made with firm-fleshed, freshly picked eggplant, these bruschettas, although simple, are loaded with flavor. If you've never made your own ricotta, make sure to give it a try. It'll only take a few minutes and your bruschettas will be transformed! Preheat gas grill to medium-high heat or prepare charcoal grill. Step 1: Lightly brush the eggplant slices with the olive oil and lay on a jellyroll pan. When the grill is ready, place slices directly on the grill and grill until grill marks appear and slices are nicely browned, 3 to 4 minutes on each side. Transfer slices back to the jellyroll pan and sprinkle with salt. When slices are cool enough to handle, cut in 1/4" dices, place in a bowl and set aside. Step 2: When ready to serve (do not prepare these ahead of time as the bread will get soggy), grill the bread slices on both sides until grill marks appear, or place under the broiler until golden-brown. Top each slice with 2 tablespoons of ricotta and spread the cheese evenly over the surface of the bread. Sprinkle with salt and pepper. Top with the chopped grilled eggplant. Drizzle with olive oil and garnish with the mint chiffonade. Serve immediately. Cook's note: If you don't have a grill, you can roast the eggplant slices in a 500ºF (260ºC) pre-heated oven for 3 to 4 minutes on each side until the slices are golden-brown.